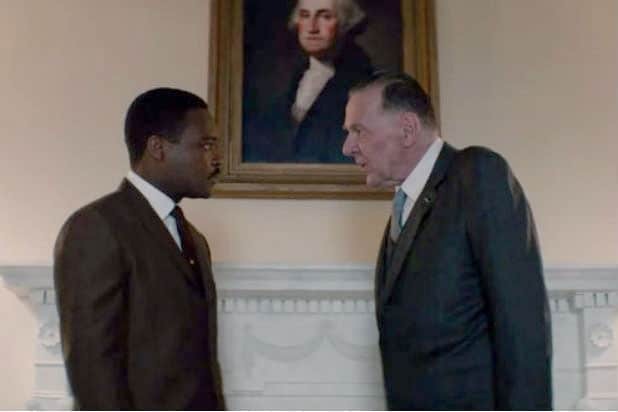 Dr. Martin Luther King Jr. (David Oyelowo) and President Lyndon B. Johnson (Tom Wilkinson) in "Selma"
“Selma” was all but shut out of the Academy Award nominations Wednesday, as the film’s star David Oyelowo and director Ava DuVernay were overlooked in the Best Actor and Best Director categories. The film, depicting the 1965 voting rights march led by Martin Luther King Jr. from Selma to Montgomery, Alabama, was nominated for Best Picture and Best Original Song. But the critically acclaimed film’s mere two nominations angered some media figures who took to social and digital spaces to express their shock at the snub. Forbes film critic Scott Mendelson writes on why director Ava DuVernay‘s “Selma” snub matters. “To the extent that one can be ‘angry’ about a certain filmmaker not being nominated for a major award that honors the best in filmmaking, I am angry,” Mendelson wrote. His colleague, Bill Weir, tweets about the demographic breakdown of Oscar voters. The Atlantic’s David Frum suggests the controversy surrounding the depiction of former President Lyndon Baines Johnson played a hand in Selma being sidelined. Is anyone surprised that Lyndon Johnson turns out to control a big block of votes at the Academy of Motion Picture Arts & Sciences? The Grio’s Chris Witherspoon turned back the calendar 86 years. Former CNN commentator and current TV One host Roland Martin urged fans to send Ava Duvernay supportive tweets. I want all of you to send a tweet to @SelmaMovie director Ava DuVernay w/the hashtag: #AvaIsTheBEST. Others turned Selma down. She rose up! PBS’ Gwen Ifill was short and sweet. So. Go see #SelmaMovie anyway. And MSNBC’s Al Sharpton called the lack of diversity “appallingly insulting,” noting the cases of Michael Brown and Eric Garner to The New York Daily News.